In Belgium, at the end of the 1800s, there were a great many herding dogs, whose type was varied and whose coats were extremely dissimilar. In order to rationalise this state of affairs, some enthusiastic dog fanciers formed a group and sought guidance from Prof. A. Reul of the Cureghem Veterinary Medical School, whom one must consider to have been the real pioneer and founder of the breed. The breed was officially born between 1891 and 1897. On September 29th, 1891, the Belgian Shepherd Dog Club (Club du Chien de Berger Belge) was founded in Brussels and in the same year on November 15th in Cureghem, Professor A Reul organised a gathering of 117 dogs, which allowed him to carry out a return and choose the best specimens. In the following years they began a real programme of selection, carrying out some very close interbreeding involving a few stud dogs. By April 3rd, 1892, a first detailed breed standard had been drawn up by the Belgian Shepherd Dog Club. One single breed was allowed, with three coat varieties. However, as was said at the time, the Belgian Shepherd only belonged to ordinary people and therefore the breed still lacked status. As a result, it wasn't until 1901 that the first Belgian Shepherds were registered with the Royal Saint-Hubert Society Stud Book (L.O.S.H.). During the following years, the prime movers among the Belgian Shepherd enthusiasts set to work with great determination to unify the type and correct the faults. It can be said that by 1910 the type and temperament of the Belgian Shepherd had been established. During the history of the Belgian Shepherd, the questions of differing but acceptable varieties and colours had led to many heated discussions. On the other hand, anything involving morphology, temperament and suitability for work has never caused any disagreement. The Belgian Shepherd Dog is a mediolineal dog, harmoniously proportioned, combining elegance and power, of medium size, with dry, strong muscle, fitting into a square, rustic, used to the open air life and built to resist the frequent atmospheric variations of the Belgian climate. Through the harmony of its shape and its high head carriage, the Belgian Shepherd Dog should give the impression of that elegant strength which has become the heritage of the selected representatives of a working breed. The Belgian Shepherd Dog is to be judged in its natural stance, without physical contact with the handler. The Belgian Shepherd Dog is a watchful and active dog, bursting with energy, and always ready to leap into action. As well as its innate skill at guarding flocks, it also possesses the highly prized qualities of the best guard dog of property. Without any hesitation it is the stubborn and keen protector of its owner. It brings together all those qualities necessary for a shepherd, defence and service dog. When judging the breed, one should take into consideration its calm and fearless temperament. The Belgian Shepherd Dog is a watchful and active dog, bursting with energy, and always ready to leap into action. As well as its innate skill at guarding flocks, it also possesses the highly prized qualities of the best guard dog of property. Without any hesitation it is the stubborn and keen protector of its owner. It brings together all those qualities necessary for a shepherd, defence and service dog. Its lively, alert temperament and its confident nature, showing no fear or aggressiveness, should be obvious in its body stance and the proud attentive expression in its sparkling eyes. When judging the breed, one should take into consideration its calm and fearless temperament. Carried high, long without exaggeration, rectilinear, well chiselled and dry. Skull and muzzle are roughly equal in length, with at the most a very slight bias in favour of the muzzle which puts the finishing touch to the whole head. The skull is of medium width, in proportion with the length of head, with a forehead flat rather than round, frontal groove not very pronounced, in profile parallel to an imaginary line extending the muzzle line. The occipital crest little developed. The brow ridges and zygomatic arches not prominent. Stop: Moderate. Nose: Black. Muzzle: Medium length and well chiselled under the eyes, narrowing gradually towards the nose like an elongated wedge. The bridge of the nose is straight and parallel to the continuation of the top line of the forehead. The mouth is well split which means that when the mouth is open the commissures of the lips are pulled right back, the jaws being well apart. Lips: Thin, tight and strongly pigmented. Cheeks: Dry and quite flat, although well muscled. Medium size, neither protruding or sunken, slightly almond shaped, obliquely set, brownish colour, preferably dark, black-rimmed eyelids, with a direct, lively, intelligent and enquiring look. Rather small, set high, distinctly triangular appearance, well-rounded outer ear, pointed tips, stiff, carried upright and vertical when the dog is alert. Strong, white teeth, regularly and strongly set in well-developed jaws. Scissor bite, a pincer bite that is preferred by sheep and livestock herders is tolerated. Complete dentition according to the dental formula. The absence of two premolars 1 (2 P1) is tolerated and the molars 3 (M3) are not taken into consideration. Well standing out, slightly elongated, rather upright, well-muscled, broadening gradually towards the shoulders, without dewlap and the nape slightly arched. Bone solid but not heavy, muscles dry and strong, front legs upright when viewed from all sides and perfectly parallel when seen from the front. Shoulder: The shoulder blade should be long and oblique, well attached, forming a sufficient angle with the humerus, ideally measuring 110-115 degrees. Upper Arm: Long and sufficiently oblique. Elbow: Firm, neither turning out or tied in. Forearm: Long and straight. Wrist (carpus): Very firm and clean. Pastern: Strong and short, as perpendicular to the ground as possible or only very slightly sloping forward. Powerful without being heavy. The length from the point of the shoulder to point of buttock equal to height at withers. Top line: Upper line of back and loins is straight. Back: Firm, short and well muscled. Loins: Solid, short, sufficiently broad, well muscled. Croup: Well muscled; only very slightly sloping. Sufficiently broad but not excessively so. Chest: Slightly broad, but well let down. The upper part of the ribs are arched. Seen from the front the fore chest is slightly broad, but without being narrow. Underline: Begins below the chest and rises gently in a harmonious curve towards the belly, which is neither drooping or tucked up, but slightly raised and moderately developed. Powerful but not heavy. In profile the hind legs are upright and when seen from behind perfectly parallel. Stifle: Approximately on the plumb line from the hip. Normal stifle angulation. Hock: Close to the ground, broad and muscled with moderate angulation. Rear Pastern: Solid and short, dewclaws not desirable. The front feet are round and cat like whilst the rear feet may be slightly oval. The toes are arched and well closed, the pads thick and springy and the nails dark and strong. Well set on and strong at the base. Of medium length, reaching at least to the hock, but preferably further. At rest carried down with the tip curved backwards at the level of the hock, raised more when moving, although without passing the horizontal. The curve towards the tip becomes more accentuated, without ever at any time forming a hook or deviation. Lively and free movement at all gaits, the Belgian Shepherd Dog is a good galloper but its normal gaits are the walk and especially the trot. The limbs move parallel to the median plane of the body. At high speed the feet come nearer to the median plane. At the trot the reach is medium, the movement even and easy, with good rear drive and the top line remains tight while the front legs are not lifted too high. Always on the move the Belgian Shepherd seem tireless, its gait is fast, springy and lively. It is capable of suddenly changing direction at full speed. Due to its exuberant character and its desire to guard and protect, it has a definite tendency to move in circles. 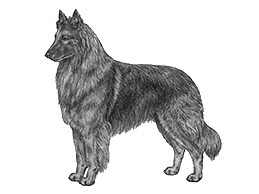 Since the coat varies in length, direction, appearance and colour among Belgian Shepherds, this particular point has been adopted as the criterion for distinguishing between the four varieties of the breed: the Groenendael, the Tervueren, the Malinois and the Laekenois. These four varieties are judged separately and can each be awarded a Challenges Certificates etc. A. LONG HAIR: The hair is short on the head, the outer side of the ears and the lower part of the legs, except on the rear side of the forearm which is covered from elbow to wrist by long hairs called fringes. The hair is long and smooth on the rest of the body and longer and more abundant around the neck and on the forechest, where it forms a collarette or ruff and a jabot or apron. The opening of the ear is protected by thick tufts of hair. From the base of the ear the hair is upright and frames the head. The back of the thighs is covered with very long abundant hair forming the culottes or breeches. The tail is furnished with long, abundant hair forming a plume. SKIN: Elastic but taut over all the body. The edges of the lips and eyelids are strongly pigmented. Limits: 2cm less, 4 cm more. General appearance: Cloddy, lacking elegance, too light or too slender, longer than high, fitting in a rectangle. Head: Heavy, too strong, lacking parallelism, not sufficiently chiselled or dry, forehead too rounded, stop too accentuated or too flat, muzzle too short or pinched, Roman nose, brow ridges or zygomatic arches too prominent. Dentition: Badly aligned incisors. Serious fault: lack of one incisor (1I), one premolar 2 (1 P2), one premolar3 (1P3) or three premolars 1 (3 P1). Neck: Slender, short or deep set. Body: Too long, thoracic cage too broad (cylindrical). Top line: Back and/or loins long, weak, sagging or arched. Underline: Too much or too little let down. Too much belly. Tail: Set too low, carried too high, forming a hook, deviated. Limbs: Bone too light or too heavy, bad upright stance in profile (e.g. front pasterns too sloping or weal wrists), from the front (feet turning in or out, out at elbow, etc), or from behind (hind legs too close, too wide apart or barrel shaped, hocks close or open, etc), too little or exaggeratedly angulated. Feet: Spreading. Gait: Moving close, too short a stride, too little drive, poor back transmission, high stepping action. Tervueren and Malinois: brindle; tints not warm enough; not enough or too much black overlay or set in patches over the body; not enough mask. Tervueren, Malinois and Laekenois: too light a fawn; a base colour which is very diluted, named washed-out, is considered a serious fault. Colour: White markings on the chest forming a tie, white on the feet going beyond the toes. Reddish tinges in the coat, grey breeches a serious fault. Temperament: Specimens lacking in self-confidence or overly nervous. DISQUALIFYING FAULTS: Temperament: Aggressive or timid specimens. General appearance: Lack of breed type. Dentition: Overshot, undershot, even if contact is not lost (reverse scissor bite), cross bite, absence of one canine (1 C), one upper carnassial (1 P4) or lower carnassial (1 M1), one molar (1M1 upper jaw or 1 M2, M3 are not taken into account), one premolar 3 (1 P3) plus one other tooth or a total of three teeth (excluding the premolars 1) or more. Nose, lips, eyelids: Strong depigmentation. Ears: Drooping or artificially kept erect. Tail: Missing or shortened at birth or by docking, carried too high and ringed or curled. Coat: Lack of undercoat. Colour: Any colours which do not correspond with those of the described varieties, too widespread white markings on fore chest especially if they reach as far as the neck, white on feet going more than halfway up the front or the back pasterns and forming socks, white markings anywhere other than forechest and toes; lack of mask, including a muzzle of lighter colour than the rest of the coat in Tervueren and Malinois. Size: Outside the limits laid down. CROSSBREEDING-MATING BETWEEN VARIETIES: Any matings between varieties are forbidden, except in exceptional circumstances, Refer to ANKC Regulation Part 6 Clause 9.11.